The League by Thatcher Heldring. Review: Suspense, action, inspiring characters. These are the things I look for in a book, but never found in the book The League by Thatcher Heldring. I found the book to be boring, never got engaged in the characters, and couldn't wait for it to end. With the school year almost over, and summer just around the corner, every one in Pilchuk is excited and ready for summer. Everyone except Wyatt Parker. Wyatt Parker is in 8th and has always followed the rules. Even if it means getting picked on by bullies, and disregarded by girls. Does he want it this way? Would you? It has finally gone too far when Spencer Randell, the school bully, takes his lunch money for the last time. Wyatt is sick of it and decides to toughen up during the summer by playing football. The only problem is that his parents have signed him up for golf camp. Golf camp is the last place Wyatt wants to be. Without football, Wyatt would continue his life of being bullied and being ignored. 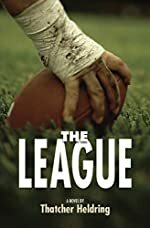 But when Wyatt fails to plead his case to his parents about football, his brother informs him about concealed league The League of Pain. Can Wyatt keep the league a secret and lie, stop getting bullied and neglected, or better yet, survive in The League of Pain? While reading The League I found myself wondering where the climax was. To me the book repeated the same cycle. I think this because the book repeated fake going to golf, play football, go home. There was no suspense or foreshadowing in between chapters. For example ÒI wondered if Brian Braun's parents entered him in the tournament without askingÓ and ÒI set the phone down and spent the next 20 minutes trying to spin football on my finger. I would recommend this book for younger children from 4th to 5th grade. I think this because there were no sophisticated words, or hard plot. Also, there were no inspiring characters in the book. I think this because in the story, Wyatt starts to steal from stores. He also lies to his parents, friends, and the people of Pilchuk. Even if he is trying to do what he wants to, I think lying and stealing is the wrong message. Overall, after reading The League I think the story is dull, with little suspense and action, and should be read by 4th and 5th graders. Review written by Sam (6th grade student). We would like to thank Random House for providing a copy of The League for this review. Have you read The League? How would you rate it?